This article first appeared in The Edge Financial Daily, on March 30, 2018. This Easter, St Regis celebrates Easter traditions from all over the world, presented in its special Global Easter Sunday brunch. The brunch features signature Easter dishes like ricotta and pepper frittatas from Italy, baked eggs from the UK and chervil soup from Germany. Enjoy this scrumptious buffet for RM368 nett per person, or RM568 for free-flowing alcoholic beverages, which include Assam Boi Mary, Veuve Clicquot and many more. To make a reservation, contact St Regis at (03) 2727 6696. For his performance at No Black Tie tomorrow, audiences can expect nothing less than raw talent, skill and a breathtaking performance from trombonist Marques Young, otherwise known as Q Sound. He began his musical studies at the age of 12 with the euphonium, under the guidance of Gordon Manley. At sixteen he played the trombone, and went on to receive numerous awards and honours during his undergraduate studies. He has since performed with many jazz greats, including saxophonist Benny Golson and Grammy-winning clarinetist Paquito D’Rivera. Catch his performance tomorrow at No Black Tie, Jalan Mesui, Kuala Lumpur, from 10pm. Tickets, priced at RM53 apiece, can be purchased at www.noblacktie.com.my. Bobo Kuala Lumpur presents pianist Misa Tamamoto and tenor Chee Shen Tan in a classical music performance entitled Romanze de Camera. The performance will feature vocal chamber music in Spanish, French, German and Italian, and includes songs like De Falla’s Siete Canciones Populares, selections from Schubert’s Winterreise and art songs by Verdi and Puccini — rarely performed in Kuala Lumpur. The performance will take place tonight at Bobo Kuala Lumpur, Jalan Bangkung, Bangsar, from 9.30pm. Tickets are priced at RM60++ apiece, and you can call (03) 2092 5002 to make a reservation. Old meets young in Generation Clash at The Bee Publika, featuring acclaimed bands Gerhana Skacinta and Flop Poppy, as well as up-and-coming bands Underpressure and 199X. The event will take place tomorrow, at The Bee Publika, Solaris Dutamas, Kuala Lumpur, from 5pm. 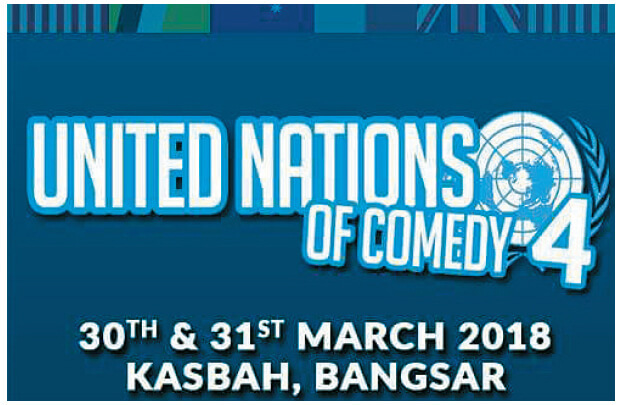 Tickets are priced at RM25, and are available at The Bee Publika, (03) 6201 8577. 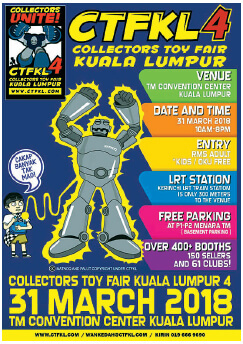 The biennial Collectors Toy Fair Kuala Lumpur (CTFKL) is back for its fourth year, this time featuring over 400 booths with 150 sellers. The toy fair debuted in 2012, and has since served as a platform for dedicated toy collectors around the country to buy, swap or sell their toys and memorabilia items. There will also be free workshops, lucky draws, cosplay contests, a charity auction and much, much more. The fair will take place tomorrow at the TM Convention Centre, Jalan Pantai Baru, Taman Bukit Pantai , Kuala Lumpur, from 10am to 8pm. The entry fee is RM5 per adult, and free of charge for children. For more info, log on to www.ctfkl.com. World Reverse Cancer Day will take place on Monday, reversing the date for World Cancer Day which takes place annually on Feb 4. 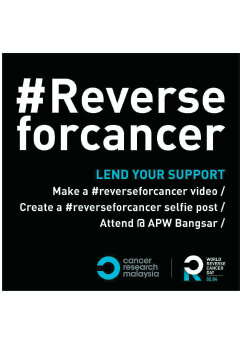 Commemorate this special occasion with Cancer Research Malaysia as they host the Reverse for Cancer event at APW Bangsar. Learn more about how scientists are reversing cancer with Cancer Research Malaysia’s top researchers. Moreover, there will be workshops, education talks, merchandise, and special appearances from Jared Lee, Jinnyboy, Talitha Tan and more! The event will take place from tomorrow to Monday, at APW Bangsar, Jalan Riong, Kuala Lumpur, from 10am. Find out more at www.cancerresearch.my. An art talk, forum and performance on Makyung will be held at Galeri Petronas this weekend. Makyung is a traditional dance-drama which originated from Pattani, and combines dance, music and drama. It features very attractive costumes and the use of musical instruments such as the rebab, tawak, gendang and more. The session will begin with two presentations, followed by a forum panelled by experts on the subject. Renowned Makyung dancer Rosnan Rahman’s performance brings the session to a close. The event will take place tomorrow, at Galeri Petronas, Kuala Lumpur, from noon to 6pm. Book your tickets now at www.eventbrite.com. 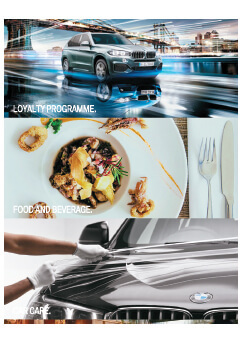 BMW Group’s new Loyalty+ Mobile App is a new mobile application for BMW White Card, MINI Black Card and BMW Excellence Club members to access their privileges on the go by enabling an easier and seamless integration of e-payment, financing services and access to luxury and one-of-a-kind events and experiences. Upon signing onto the app, available for both Apple and Android users, customers have access to a landing page, with the options to peruse and act on the menu content. There are several functions customers can engage with on the app, including accessing their loyalty cards and use the QR scanning technology to gain remote access. The app will also allow for the latest updates on customer privileges and events to be delivered directly to their phone. Additionally, financing information can be managed quickly and easily through the app, and here customers get a quick access to their contract overview, with an intuitive e-payment interface for more convenient transactions, courtesy of BMW Group Financial Services Malaysia. The BMW Group Loyalty+ Mobile App also includes a dealer locator function where a dealership map is accessible with the swipe on the screen. Customers can also explore new updates and news on the latest vehicle models from BMW. 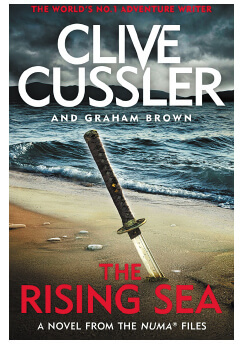 Clive Cussler’s new Kurt Austin adventure in the Numa Files series is out! In The Rising Sea, the world’s sea levels are rising at an alarming rate, too quickly to be caused by glacier melt. A risk so big it sends Austin, Zoe Zavala and the Numa team rocketing around the world in search for answers. Their hunt takes them from the shark-filled waters of Asia to the high-tech streets of Tokyo to a forbidden secret island, but it’s in the East China Sea that a mysterious underwater mining operation is discovered. Austin uncovers a plot more dangerous than they could have imagined: a plan to upset the Pacific balance of power, threatening the lives of millions. It falls to the Numa team to risk everything to stop it and save the world from the coming catastrophe. RM84.95 on malaysia.kinokuniya.com.